When I was growing up, my mom usually stuck to familiar (read, bland) dishes that were not very exciting or tasty! Shrimp was definitely not on the menu. It took me years to develop a taste for seafood. Raising my own kids, I have found that, if you introduce new flavors and tastes at an early age, they often become less picky eaters. Shrimp is a great first step into shellfish dishes. It is low fat and healthy, not to mention the most popular seafood in the United States. This garlic shrimp and rice recipe is simple, tasty and good for you. Kids love rice dishes, and the aroma of garlic from the kitchen is enticing at dinnertime. By mixing in fresh vegetables with the stir fry, you can sneak in a serving of veggies too! A serving size of shrimp (4 oz.) has only about 100 calories, and is an excellent source of protein, tryptophan (helpful for sleep and mood stabilization) vitamin B12, omega-3 fatty acids and selenium. If using frozen shrimp, thaw completely in a strainer under running cold water. Drain. 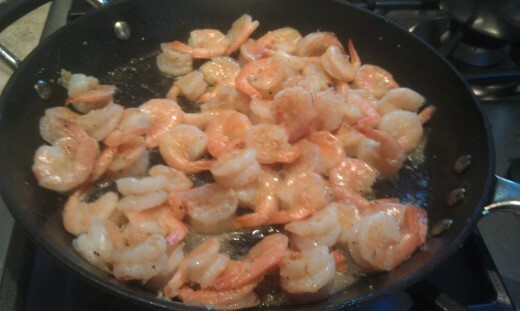 In a large skillet, heat olive oil, add garlic, shrimp, salt and pepper. Cook over medium-high heat for 3-4 minutes until shrimp is pink. During the last minute of cooking, add white wine and lemon juice. Remove from heat. This recipe is easiest with Minute Rice. Bring 3 cups of water to a boil, stir in 3 cups instant rice, cover and remove from heat. Allow to stand for 5 minutes until water is absorbed. 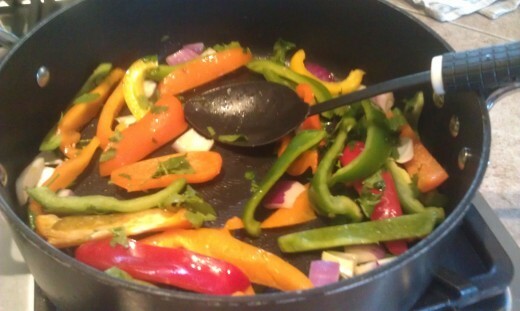 While rice is cooking, stir fry chopped vegetables in 1-2 tablespoons of olive oil. Cook 2-3 minutes. Stir in cooked shrimp and garlic. 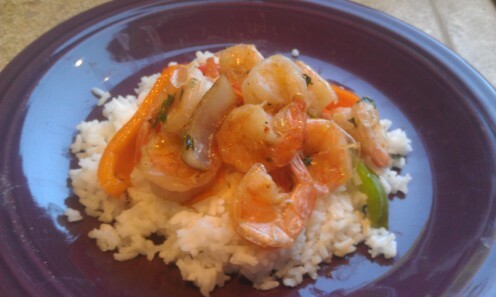 Serve garlic shrimp and vegetables over rice and sprinkle with chopped fresh cilantro. If desired, add soy sauce to taste. Enjoy! Use the freshest shrimp possible, or frozen shrimp that you have just thawed. 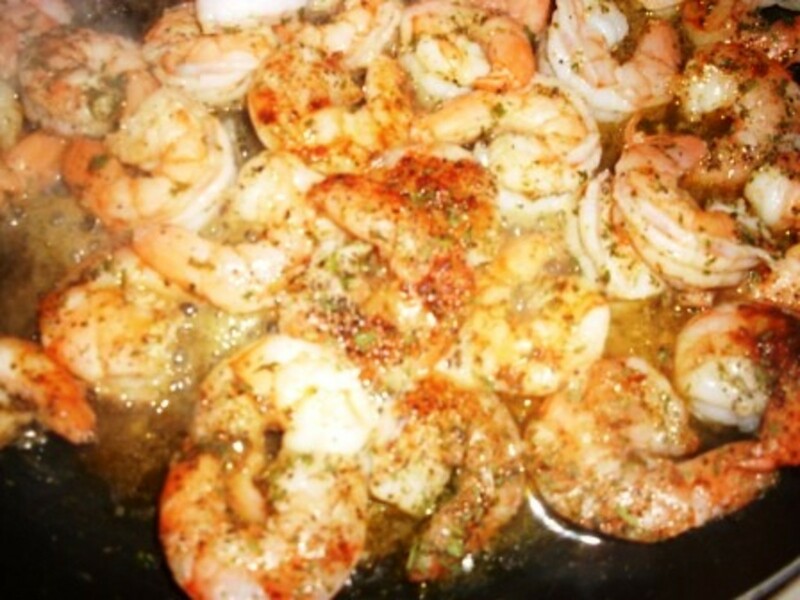 If the shrimp has a "fishy" smell, discard and do not cook or eat. It should smell like the ocean: clean and fresh. Before serving garlic shrimp and rice to young children remove the tails of the shrimp. Make sure that no one in the family or at the dinner table has a shellfish allergy. Leftovers can be refrigerated for 1-2 days. Reheat in a skillet over medium-low heat for 1 minute. Microwaving left over shrimp will affect the taste and texture. For a different taste, try adding broccoli or sliced white mushrooms to the vegetable stir-fry. In place of white wine, add chicken stock or vegetable broth. Serve garlic shrimp and rice with a fresh green salad or fruit salad. Kids love iced summer drinks like lemonade or sparkling water. Do You Like Garlic Shrimp? Hello, what an amazing recipe, sounds delicious and it seems both easy and quick, will certainly try it, I think my twins will like it... Voted up and useful, sharing and pinning! Have a wonderful day! Stephanie, coming from a land where seafood is kind of everyday stuff, prawn and lobsters are some of our most favorite preparations. Like you have done it here, we too prefer it with rice rather than any bread and we usually have vegetable curry to accompany. This quick and light preparation will be really tasty and an interesting dish for those not yet familiar with shellfish. Voted up and sharing. I'm with DzyMsLizzy...I don't like to spend hours in the kitchen--I want to get in and out of there as quickly as I can, but with a great tasting meal to serve. This sounds like just the thing, and pretty healthy, too! I don't remember having shrimp as a kid either. I know I love it, just about any way you can fix it. This looks delicious and easy too. I will be trying this very soon! We need a "yummy" button! Voted up! I love shrimp! This recipe sounds and looks great. I used to always buy prawns when I lived in Seattle ... one of the many things I miss about the west coast. We can get large shrimp here but somehow they're just not the same. This looks so yummy! I love shrimp, I love rice, and I love garlic. 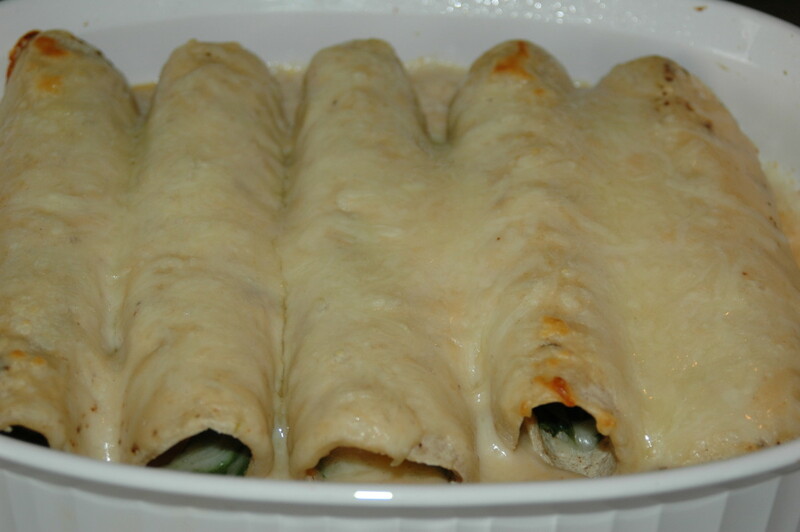 This looks quick and easy, my favorites in a recipe. I will try it this week. Thanks shleglebagel and Danette! It is a great recipe. My kids ask me to make the shrimp and rice recipe each week. Glad that it has become a favorite! I serve a similar dish. My husband and I eat shrimp fairly often. I'm lucky enough to be able to pick up bags of frozen shrimp at a good price there and since I'm not good at cooking fish, this helps us get some seafood in. I just got some shrimp at the store and I think we will have try this recipe. It looks very good. I love easy shrimp recipes! Thanks for another great idea. Love your pictures. 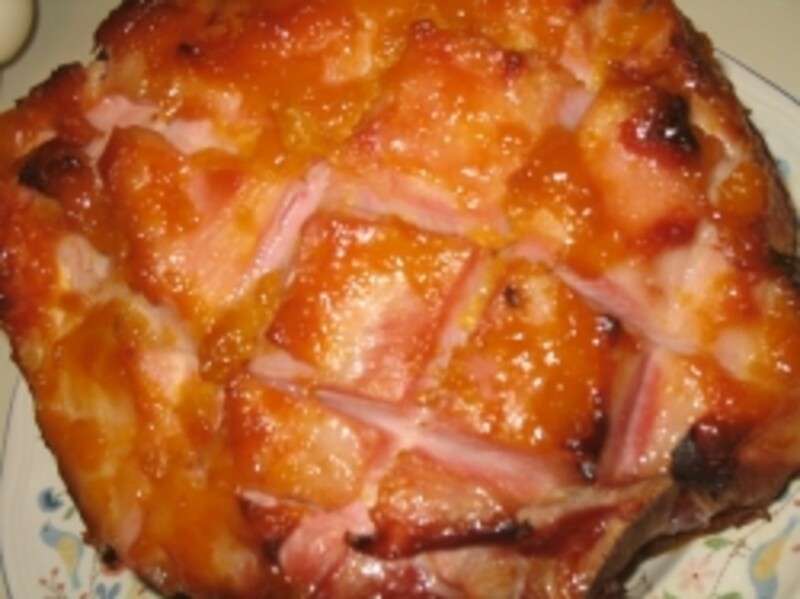 Yet another great recipe post. 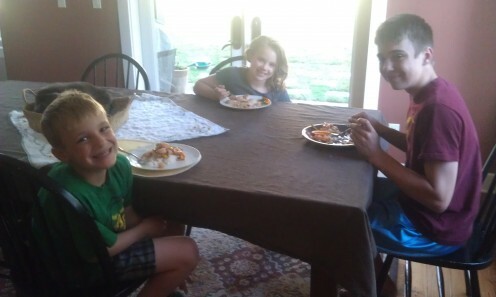 The kids look like they really enjoy the meal. I love having shrimp and rice together as the tastes are marry well. Yum....I prepare quite a few meals for my family who lives close by. Shrimp is a favorite. I will have to give this a try. It looks delicious. Thank you for sharing this. This looks absolutely yummy! I will try it asap. I love shrimp and will use it in as many dishes as I can. I would really love a great shrimp curry recipe. Mine doesn't excite me as much as I would like. Thanks, Steph. Your kids look like they are enjoying the meal! Glad to know that shrimps are of low fat. I'll definitely follow the instruction on how to prepare garlic shrimps and rice. Just to know how delicious this could be. Thanks for sharing. Sounds great! I like the idea of adding cilantro. Seems easy and delicious, and like you could easily add your own special touches. Thanks for sharing this! Thanks everyone for the comment and votes! I love shrimp so much now that I find it amazing we never had it when I was growing up. This sounds really good. Enjoyed your hub. Our kids always loved shrimp even when they were young.